It seems that we have caught Design Contest Fever here at Hackaday. After covering some other design contests, and asking readers to send in more, we heard from a couple tippers about Renesas’ challenge. Like many of the other contests, entrants can submit their ideas, and possibly receive a free development board to get them started. 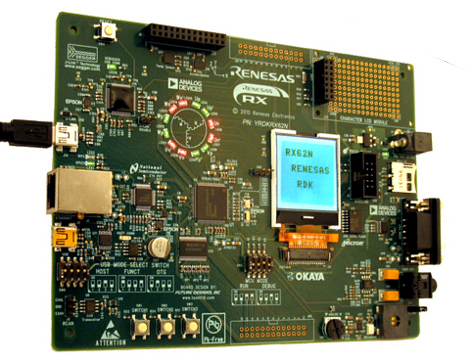 Unlike the other contests though, Renesas board (possibly) free development board is everything but the kitchen sink. Designed with RTOS’s in mind, rather than the normal microcontroller tasks, this board has an astounding number of capabilities. On top of the excellent development kit, the contest is also offering books, software, and cash prizes to the winners. So get out there, design something amazing, and make Hackaday proud. Registered. This thing has almost everything I could ever want in a board. Saweet! I would love a chance to play with the board, but I can’t think of anything worth building with it. I’m used to simple circuits with a $5 uC and a few LEDs. Maybe Doppler Direction/Range Finding…? It’s been done already though. Just a tip: Don’t plug 12 VDC into the +5 jack like I did. I toasted a little 1-bit-wide level shifter for the CAN bus and the USB Host power controller. Removing them got the board working again thankfully. I’ve got to be more careful. But, this board has like 5,000 parts on it and they couldn’t put in a bridge and a 5 Volt regulator so we can use any old wallwart lying around? Still, it was 100% my fault for not readnig the silk. i’ve already submitted my abstract. hopefully i can get one. plan is, go with my abstract, and win some money. if all else fails, i have a new platform to play with. Can anybody elaborate on how this is better than arduinos? It seems more elaborate but how? What is RTOS? Nice, they included a Flux Capactor too!!! The idea is that with this hardware you can multitask, something without careful programming you can’t do with an arduino. CutThroughStuffGuy – You can’t compare this thing to an Arduino. It’s triple the cost, much faster, and has so much more built in. From what I can see in the picture, it has an ethernet connector, two USBs, two audio jacks, an SD card slot, some sort of audio transducer, a potentiometer, several buttons, an LCD, several headers for an additional LCD and various other devices, some kind of serial connecter, a lot of LEDs… plus it has a much more advanced SDK. This is a professional board, not a cheap hobby board for learning to flash LEDs and print “Hello World” over serial. All signed up. Thought of a perfect application that will not only be useful but also make use of many of the onboard peripherals. They don’t really give you a lot of room to communicate your idea. Anyone else get to the max character limit and find that you can no longer edit your abstract? It wouldn’t even let me Ctl+C what I had, so I ended up having to retype it! Sorry, but that pisses me off. We’re not allowed to participate any f- contest outside Quebec. I had the exact same problem while I was typing out my abstract. You couldn’t ctrl+c it, but you could rclick to copy, then paste over it. I couldn’t think of a much better use for the board than in my undergrad research at school (phys chem), so I have a feeling my idea is going to end up being more specialized than they’d ideally like. Honestly, though, I’d just be happy with getting the board, even if I don’t have a great chance of winning. If it’s anything like the other Renesas boards then it’s horrible. The code is compiled using a Windows-only environment and it’s only been in the last few years that GCC has been ported to these platforms. Also, the board I was using was supposed to be programmed in ANSI standard C but that turned out not to be the case when using some pre-processor directives. I’m not a fan of Renesas. There are much better platforms out there from the likes of TI, Atmel, and others. Don’t mind Nicko01’s condescending comment. I really hope that they haven’t run out of kits yet. Does anyone know what the status is on this? The latest update I can find is that 809 boards had been given away as of November 9th. >Renesas boards then it’s horrible. Now come on.. Renesas has a ton of architectures. Some from Hitachi, some from Mitsubishi and some from NEC IIRC. The H8 and SH stuff I have is great. It’s a shame the debugging stuff doesn’t work in non-windows environments.. but that’s the same for everything. Renesas pay Kpit to develop and support GCC+binutils toolchains for all of their processor lines IIRC. HEW is windows only..
but from what I gather Renesas want people to use GCC and not their legacy C compilers. I think H8 support in binutils/GCC is older than AVR or support for any TI platform. And it works really really well. ANSI C doesn’t have support for processor specific stuff.. that’s what you have inline assembly etc for. GCC has a list of the attributes you need to add to for example make a function into an interrupt handler for each arch. The Renesas compilers had all of this too. >I’m not a fan of Renesas. I guess you had one board… and couldn’t work out how to use it? Couldn’t work out how to use it == Not my fault, bad tools right? And why is Renesas one of if not the biggest MCU supplier? The H8 is an awesome micro if you can get a board for it (hobby boards aren’t seen much outside of Japan), SH was the fastest arch per watt in the world for a long time.. R8C etc are great if you need something on the same level as an AVR. This isn’t an ATmega killer.. this is an ARM killer. The details are pretty limited on the architecture (I was guessing it was going to be a continuation of the SuperH line) unless you can be arsed to read the user manual for the RX62. This chip has tons of general purpose registers, hardware multiply and divide, hardware float instructions, proper DMA controller, USB and Ethernet controllers.. hell, it has a hardware CRC calculator. I guess the reason Renasas are giving away boards is to show people outside of Japan that there is something other than ARM or MIPS. A big problem for a hobbyist using Renesas parts is A: Only places like AkizukiDenshi in Japan sell hobby boards, B: Unless you can read Japanese you won’t have access to all of the example code, howto’s etc that are out there. But… the English user manuals are excellent! The Renesas stuff mostly pre-dates ARM. As cantido said, they’re a merger of Hitachi, NEC, and Mitsubishi microcontroller lines, All of which has relatively significant followings in certain markets. (but none in most hobbyist oriented markets.) Renesas is sorta holding on against ARM taking over. Whack, the contest form has been actively denying me from registering for almost a day now. It keeps giving me a referrer error. Anyone else see this? Dang it I wish I had the spare time. If anybody is board and want some suggestions. 1. Autopilot. Add in a GPS, gyros, and a datalink like an XBee and you could have a complete autopilot. 2. Automotive infotainment system. Add a GPS ,LCD ,an HD or flash drive and and IDE CD or DVD drive and you have a good start on a automotive infotainment system. I think it does have CAN on it so maybe an entire digital dash. 3. Network attached home stereo system.. Okay a bit of over kill for this maybe depending on how bold one gets. 4. Low power network monitoring system. 5. Robot. Just go nuts maybe even use the kinnect with it. Posting in an ancient thread, but I was the guy who mentioned putting in an abstract regarding the physical chemistry research. Just got my board today. I’d totally forgotten about the contest, I’m stoked to have one to start playing with. We’re going to be working on interfacing it with the various heavy duty instruments around the chem building (Mass, HNMR, IR specs) for remote operation/data collection and transmission. There’s a lot of big modeling projects being worked on in our lab’s beowulf cluster, being able to stay there and get updates from the various instrument rooms in real time would be pretty useful. My board showed up today as well. Neat board, managed to get the other examples working. I also got my board today. I got the examples working, fun little thing. I am a bit annoyed that the compiler that came with it only has a 60 day full product evaluation until it gimps itself, but hey, beggars cannot be choosers. Mine came too. Can’t wait to play with it. Interesting, my entry was about using it as a robotics control platform (that we use to do chemistry) We may have some of the same requirements and should consider working together on some of it. I had forgotten I put in for one of these, fedex knocked at the door and there it was. Very nice kit. Can’t wait to get it going. I started my project using the pic micros and I was banging my head against a pic related issue when fed ex arrived. Anyone else notice some slight corrosion on the ethernet , usb ports area ? I had to clean that area with some alcohol . Not sure what the residue is, if its flux or something it picked up sitting on a shelf. I received mine today as well. Great little board, I’ll be looking more into when christmas is a bit closer. Got an email from admin saying a package had arrived for me on campus, walk down to figure out what it is. See “Renesas” on package, never got an email or anything from them just showed up xD this thing rocks! I just received mine :). Currently downloading the latest software, so I haven’t even fired it up but I’m excited. After working with the stk500 for a long time, it’s great to see all the extras stuffed into this thing. I’m going to try turning it into an accelerometer/temperature/pressure (using an ms5607) logger, with shutter control for a camera, then fly it on a balloon. Andrew Kowalczyk has added a new project titled EFM32 Dev Board. Richard Neail liked Kobold - retro TTL computer. brian brocken has updated components for the project titled RC FPV tank rover. Sophi Kravitz started following AI at the Edge Hack Chat with NVIDIA. brian brocken has updated the project titled RC FPV tank rover. sjm4306 wrote a reply on Vacuum tube single digit calculator. PlayOctobo wrote a comment on Supplyframe DesignLab: 2019 Hackaday Prize . Kevin Harrington has added a new log for SmallKat: An adorable dynamics oriented robot cat .